Kind of sweet and sentimental and actually the last sketch I did on my roundabout trip to the grocery store with pastels and camera. 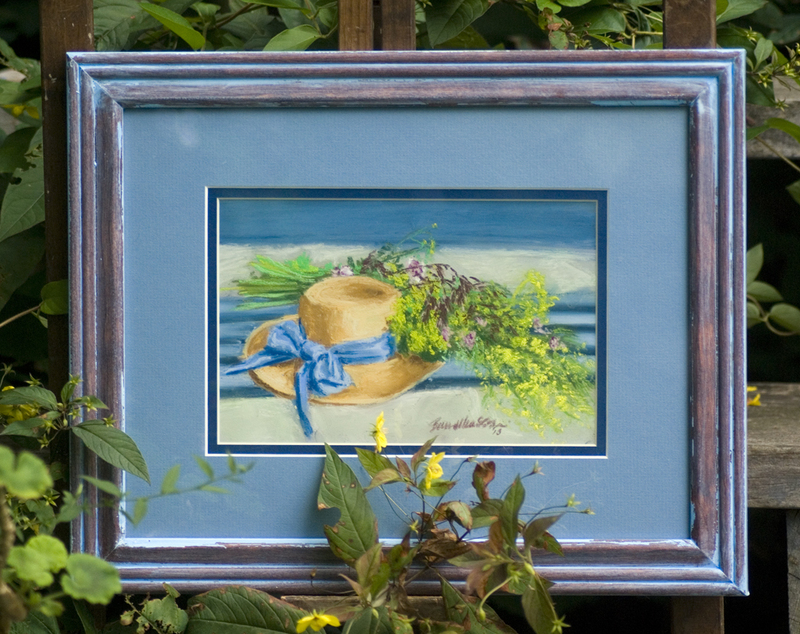 When I came home and parked my bike to unpack it, I untied the bunch of wildflowers I’d gathered and my sketching hat from the back of my bike and set them on my porch swing, then removed the bungies holding my bags of groceries underneath where they had been. I put everything in the house and came back out to get my hat and put the flowers in the vases on my porch and yard, and immediately felt another sketch coming on. This is the straw hat I wear when I sketch. I can’t stand in the sun for too long without protecting my eyes, and especially not when I’m literally studying the sunny landscape for the time it takes to do a sketch, but I can’t wear my sunglasses because they change the colors. So I wear a straw hat, which puts my eyes and my entire face in shade so I can focus without squinting and see my colors without any modification. This particular hat is a pretty tight weave so it provides a deep shade, and the brim is the perfect width, not so far that it falls into my peripheral vision, but far enough, and stiff enough, to simply provide a cover. It fits me well, too, especially fitting a lot of my thick longish curly hair up underneath, though I do add a pin to be sure it stays in place. To paint From Hammond Street I was standing on a bridge above the creek, enjoying the breeze, and a few times, without the pin, the hat would have sailed off and down to float in the creek. The wildflowers are some of my favorite colors at this time of the year for their brilliance. The longish stems of tiny yellow flowers on the right are yellow sweet clover, and its scent is intoxicating, that legendary scent of clover that grow in bunches just about anywhere. The yellow green bunches behind them are wild parsnip, an easily adaptable plant that can grow from two to six feet tall and kind of looks like a really big parsley plant with panicles of tiny yellow-green flowers; think of a large yellow Queen Anne’s Lace, though that comes later. The pink flowers are crown vetch, related to wild sweet peas that’s planted on hillsides and roadsides to hold soil in place and control the growth of other plants. The burgundy is a grass with lovely graceful burgundy seed heads that I just can’t identify! The sketch is done in pastels on sanded pastel paper. The mats are 2.5″, deep blue under mat and medium blue top mat. 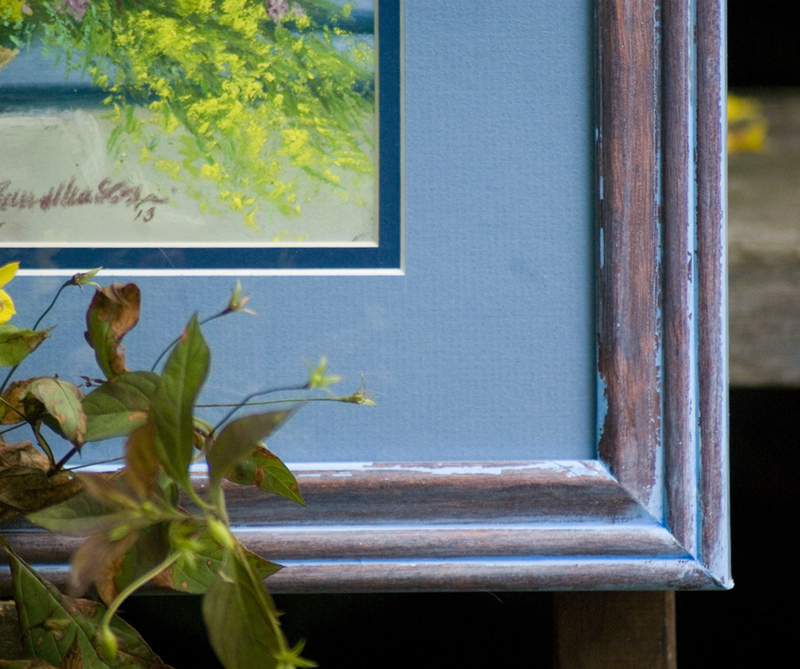 Frame is 10″ x 13″, walnut with blue washes I added to coordinate with the blues in the painting and the mats. 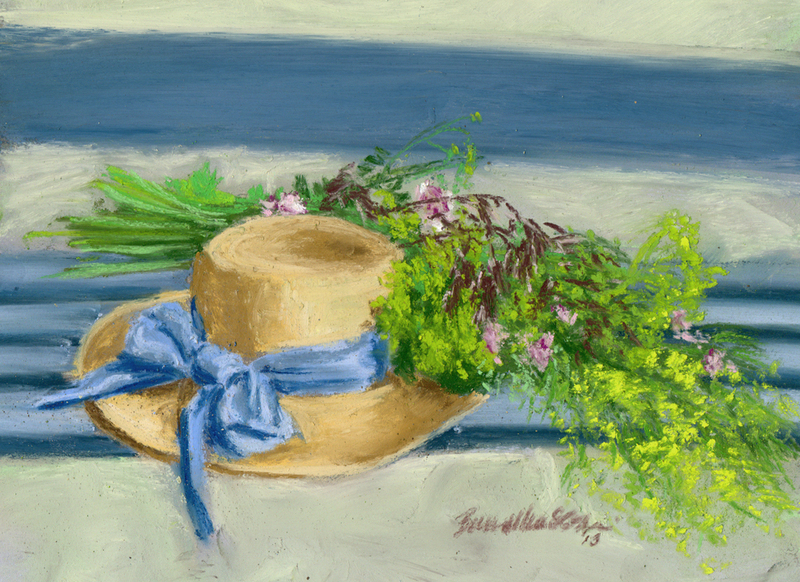 This entry was posted in canvas print, giclee print, nature artwork, pastel, print, prints of artwork, still lifes and tagged blue, canvas print, digital prints, en plein air, giclee, pastel, pastel sketch, straw hat, wildflowers on July 14, 2016 by Bernadette.